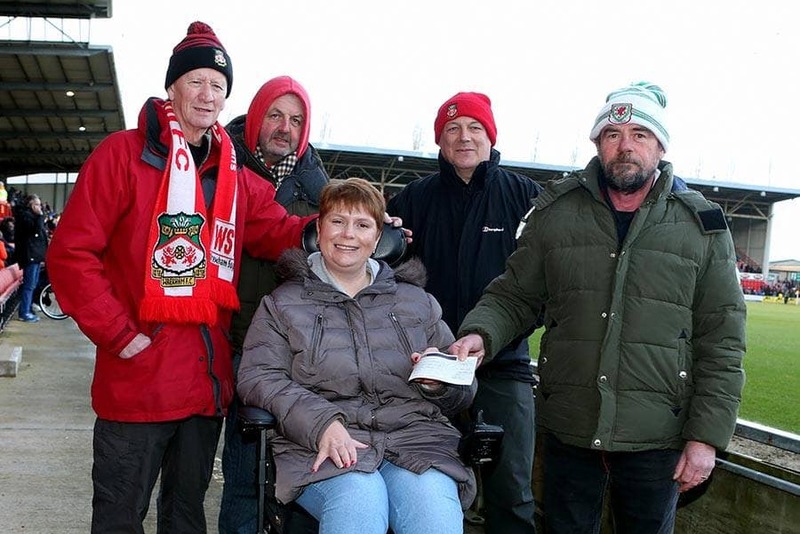 At half time at our game against Dagenham & Redbridge we were delighted to present Kerry Evans, Wrexham AFC Disability Liaison Officer, with a cheque to pay towards the cost of the Autism quiet room as well as the Accessible Away Travel to the Halifax game. 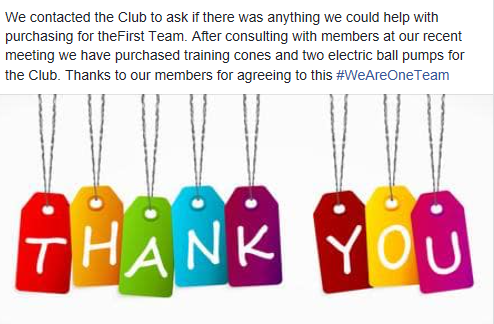 Thanks to our members and keep up the good work Kerry! The total is in! We are still in the process of collecting the last of the payments but we can announce that we made on the day a total of £1,178!!! We are going to add in a small donation to take the final total to £1,200!!! 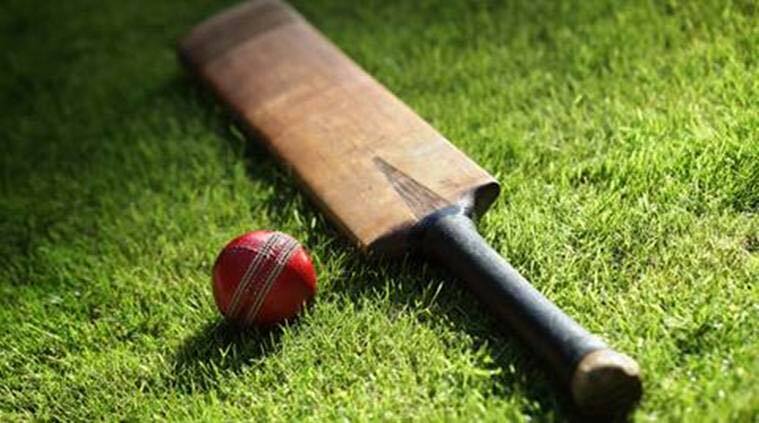 Thank you so much to everyone who attended, our sponsors, our auction, raffle and horse race winners, Dave the Race Man and Mold Cricket Club as well as Buckley and District Reds for all your superb support!!!! 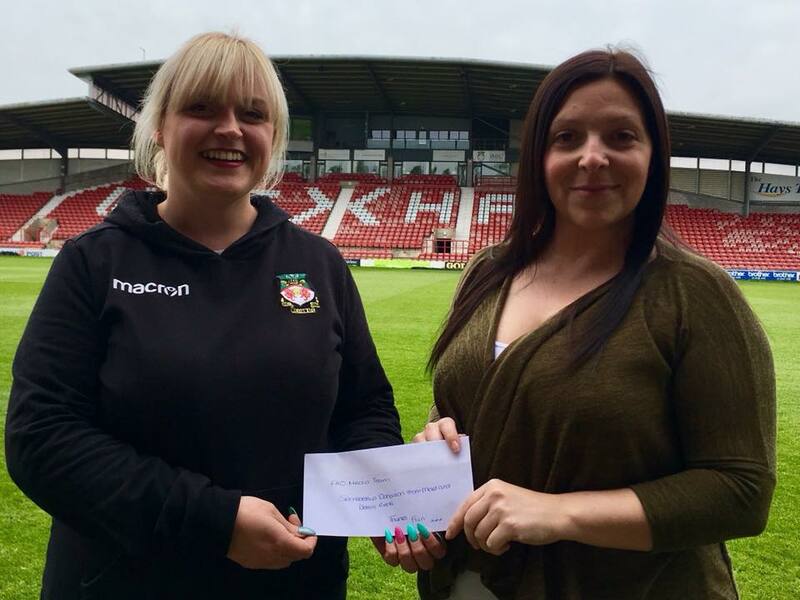 It was agreed at our last members meeting that we will go ahead with sponsoring Wrexham Disability Football Club (now renamed Wrexham Inclusion Football Club) when they take part in the 2018 Mental Health Football Championships in Munich, Germany. 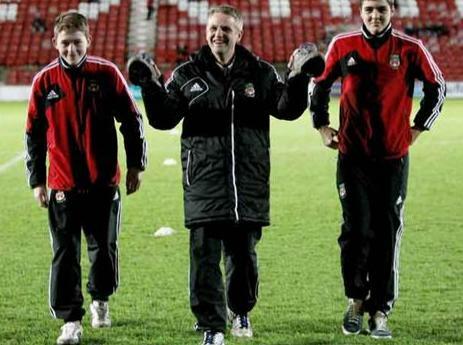 They are regarded as the biggest voluntary club in the UK for Mental Health. During May 2017, WIFC participated against teams from Germany, France, Czech Republic, Slovenia eventually finishing 4th place in Europe. The £30 donation will go towards having our logo on their huge flag which they will be taking to the Championships with them. Thank you so much to our members for agreeing to sponsor the team and we wish them luck this year in the competition. 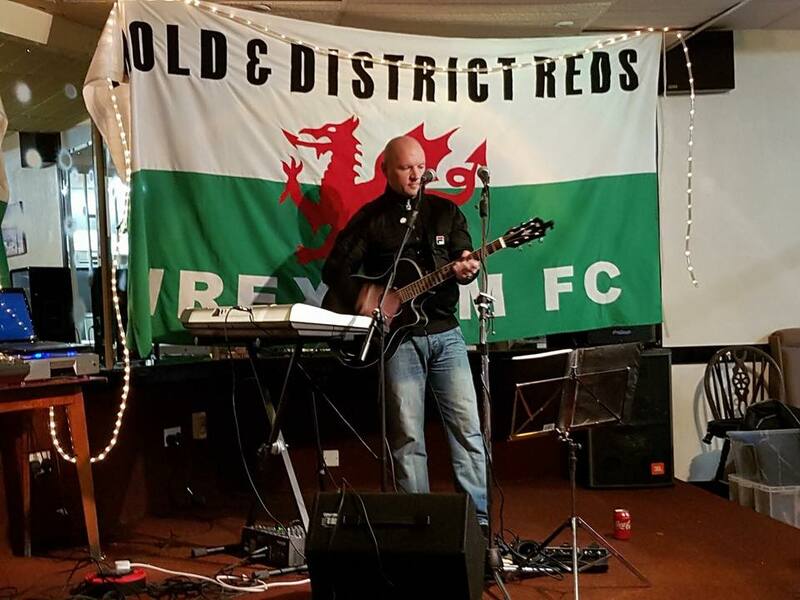 Massive thanks to Gaz Owen for performing at our Xmas party this year. Many thanks also to the members who attended the party. 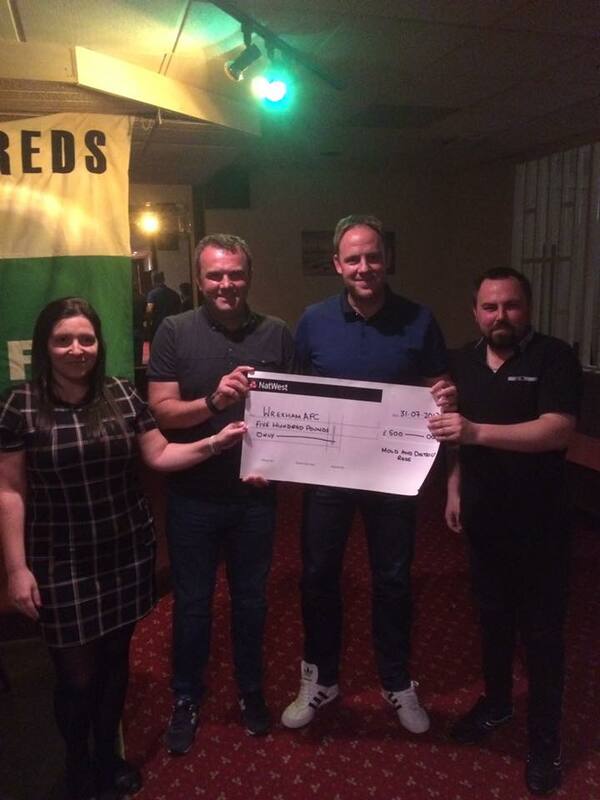 We's like to thank everyone who contributed to fundraising on the night through the raffles and auctions and donations, it's was very much appreciated. 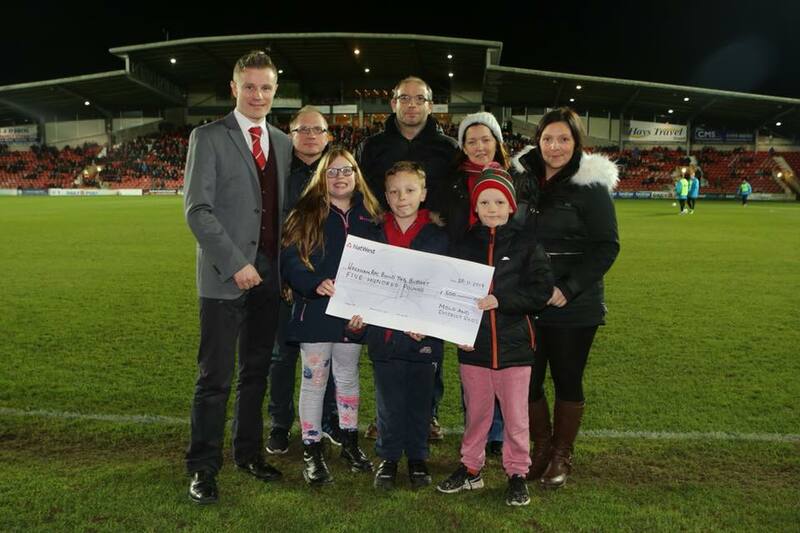 Thanks to our members who came on the pitch at half time on Tuesday 21st November to present a cheque for £500 to Spencer Harris and the Club for the Build the Budget campaign. We really have the best fans. Thank you so much to all our members who voted at our last meeting to donate £500 to the Build the Budget campaign. That’s brings our total donation to the campaign to £1,000!!!! 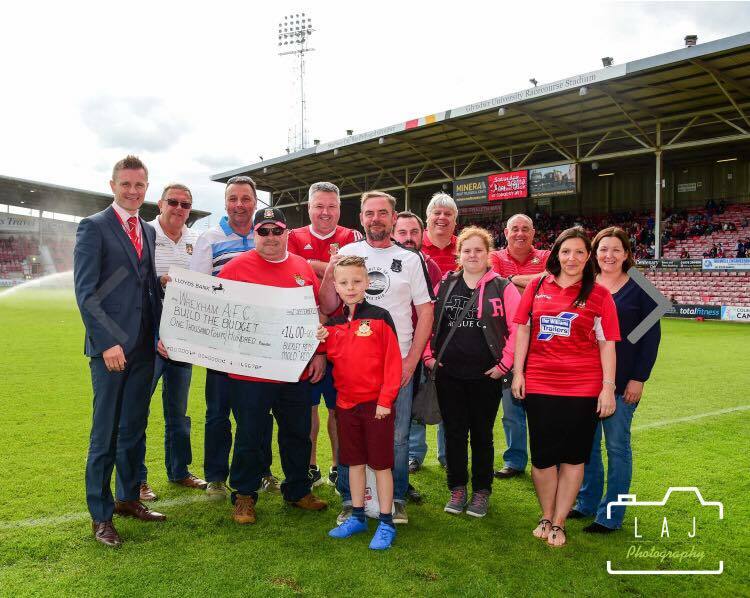 Alongside Buckley Reds our members presented a cheque for £1,400 to Spencer Harris and the Club for the money raised at our recent charity cricket match. Picture credit: LAJ Photography. Please visit https://www.laj-photography.co.uk/football/nggallery/galleries/Wrexham-vs-Bromley to view some great photos of the Bromley game. 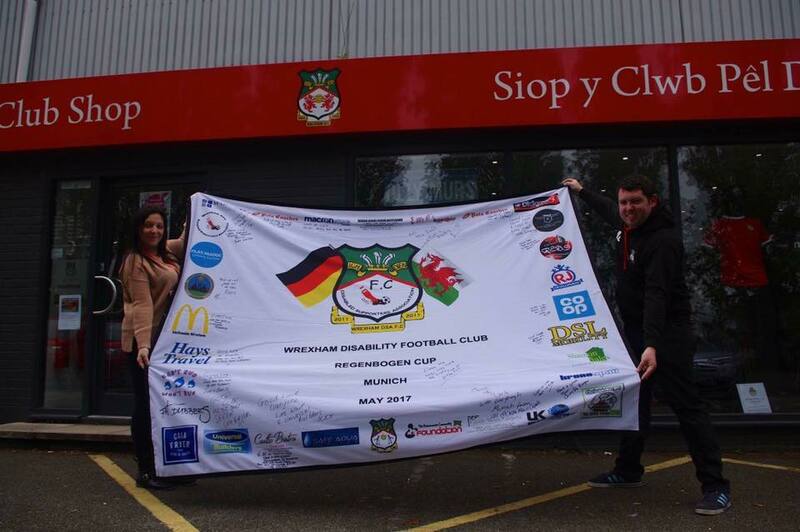 Our Chair Fran Merola writing a good luck message on behalf of Mold and District Reds on the Wrexham DSA Football Club Munich flag ahead of the tournament. Mold & District Reds were very proud to sponsor the team. 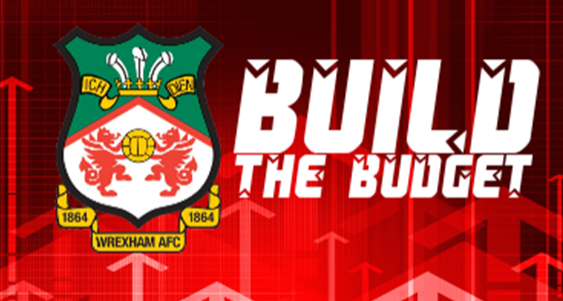 Over the last few weeks the Club has launched the Build the Budget campaign to assist Dean Keates and Andy Davies with the playing budget for next season. As a group we have to decided to donate £500 to the campaign on behalf of our members. Thank you so much for your support to help raise this throughout the season. 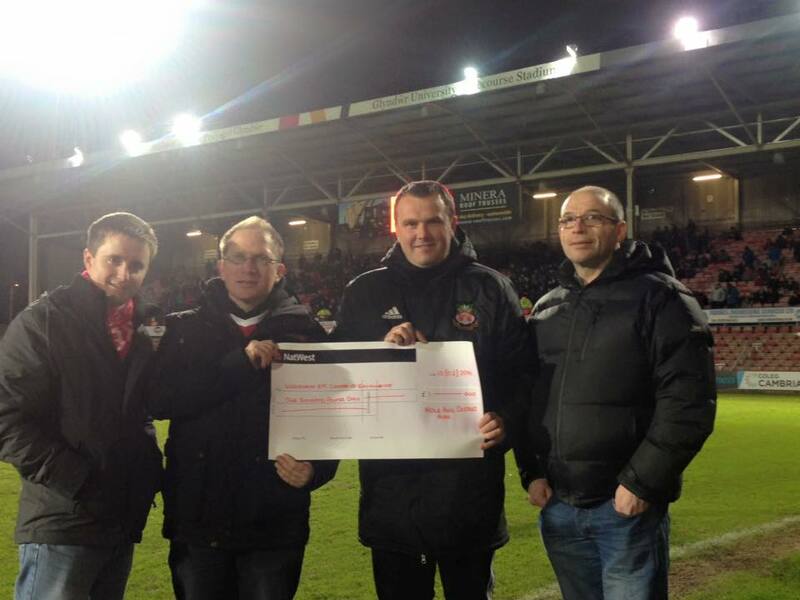 Mold and District Reds members presenting a cheque for £1,000 to Andy Davies for the Centre of Excellence at tonight's game . Well done to all our fantastic members for helping to raise this money. 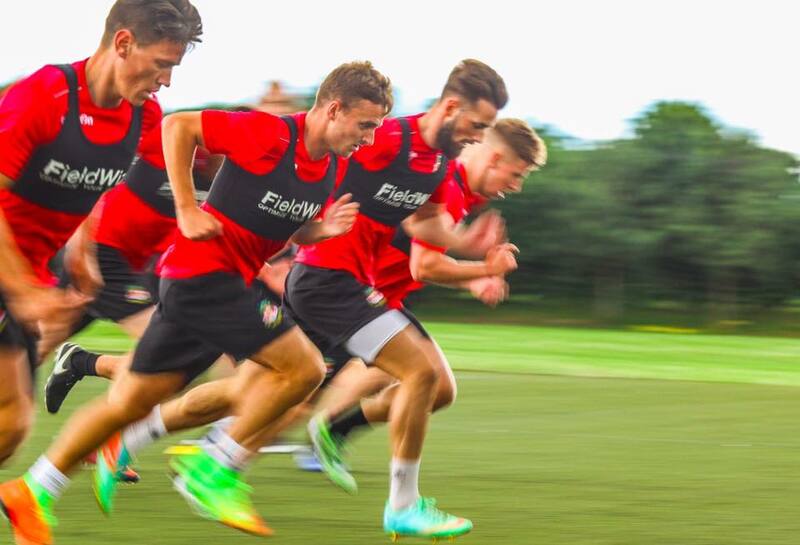 We would just like to pass on our thanks to Chris Davies one of our members who has kindly donated a Wrexham home shirt signed by all the players as an auction prize. 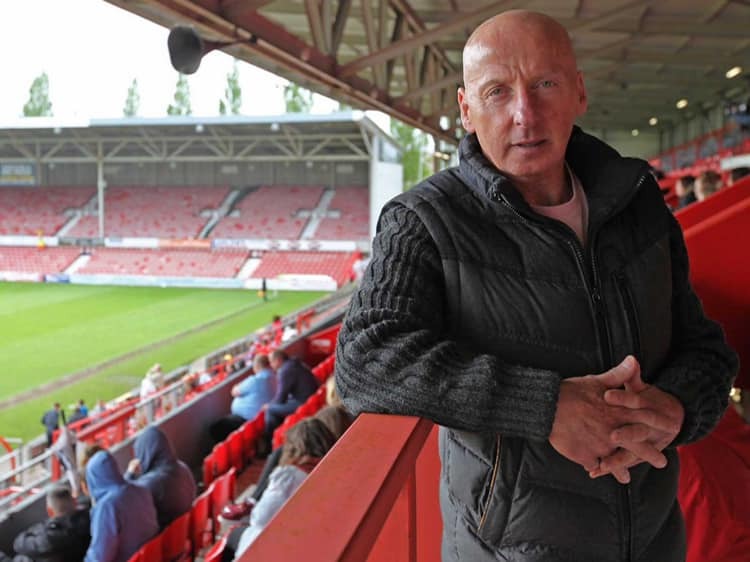 We would also like to thank Graham Toque for donating a signed Notts Forest ball that we will be auctioning off probably on Ebay just as soon as we have found out more details on the age of it. We have also been given some match day posters dating back to the 70s, including a Wales match, by Mold and District Reds member Les Buxton who has kindly donated them to raise money. 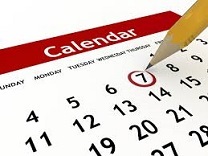 be applied at the same time. At our recent meeting Mold and District Reds members have agreed to donate £300 towards the cost of this. 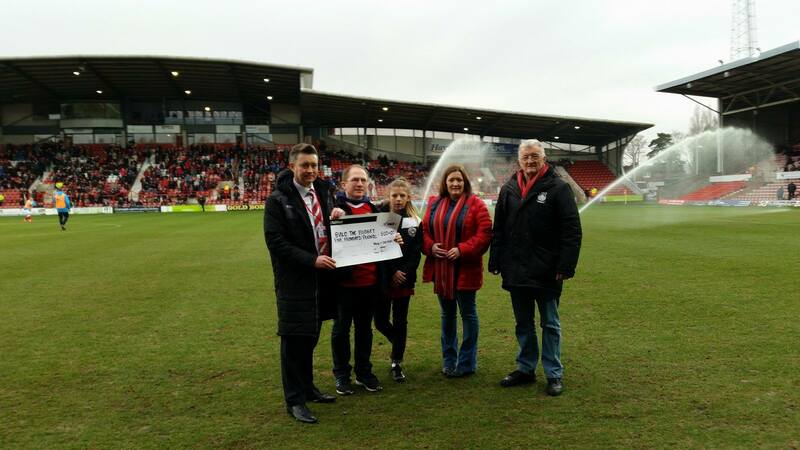 It was proposed and seconded, that we make a donation of £500 towards the pitch covers required by the club. 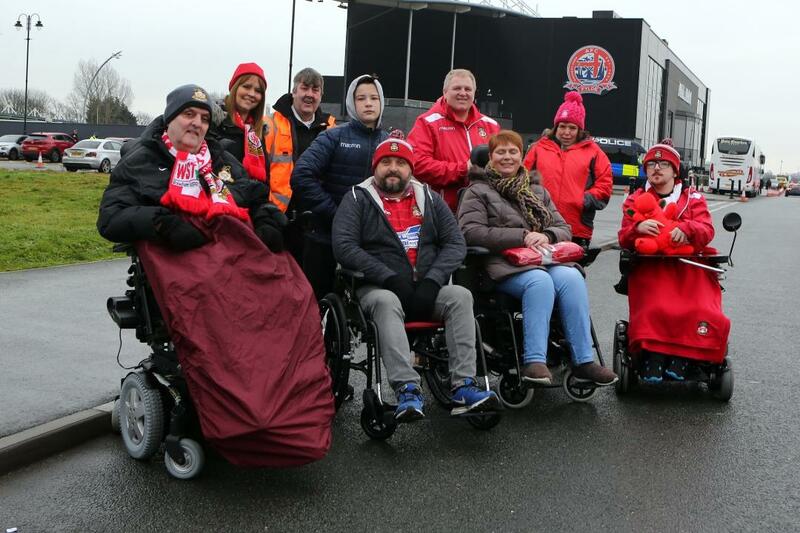 All supporters groups have been asked to donate towards the covers, the club are hoping that 50% of the cost would be covered by these groups. 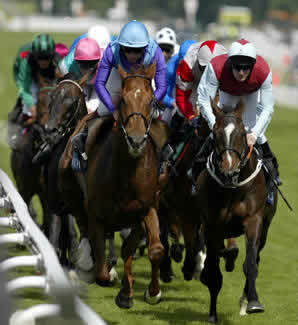 Our racenight went incredibly well and the final amount raised was: £1,300!!. 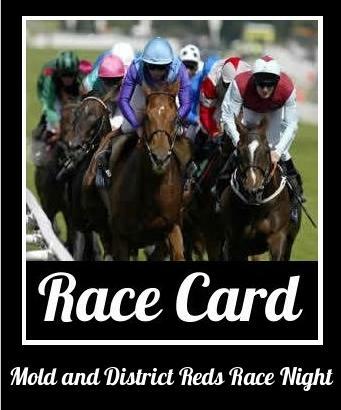 A big thank you to all the following: Don Bircham (Hays Travel), Race Sponsors, Horse Sponsors, Top Club and Jan Merola (programmes) and to all our members and guests, who supported the event on the night and help make it so successful. The Centre of Excellence fundraising night raised £705.25. 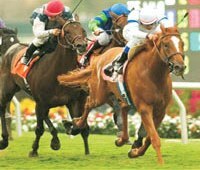 Well done and thank you to everyone who attended for their support. ...... was £1145.60p !!!. 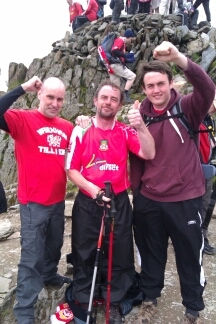 Fantastic effort from you all !! !